A cultured pearl and yellow gold necklace. A yellow gold, cultured pearl and sapphire necklace. A lot of yellow gold jewels. A diamond and white gold ring by CHAUMET model “Lien”. A yellow gold and coral pair of earring pendants. A yellow gold, green stone and natural pearl brooch. A yellow gold, natural pearl and enamel bracelet. A yellow gold, turquoise and natural pearl pendant. A yellow gold, red gem and diamond ring. A yellow gold, diamond and pearl ring. A yellow gold and micro-mosaic bracelet. A cultured pearl white gold necklace, accompanied by a report from the Laboratoire Français de Gemmologie stating the pearls are cultured, of saltwater origin, white cream and rounded shape. A yellow gold, cultured pearl and enamel brooch. An yellow gold, amethyst and pearl necklace. A yellow gold diamond pair of cufflinks. A yellow gold coral ring. A diamond and yellow gold pair of earrings. A turquoise and yellow gold ring. A white gold, turquoise and diamond ring. A yellow gold, tourmaline, ruby and diamond ring. A white gold, saphhire and diamond ring. 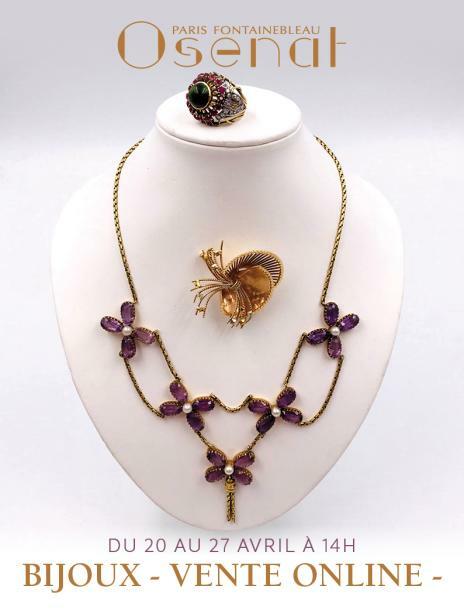 An amethyst yellow gold necklace, and a peridot yellow gold necklace. A diamond and platinum ring, with a yellow gold cross. A sapphire and yellow gold ring. A cultured pearl and white gold necklace. A yellow gold, sapphire and diamond necklace. A yellow gold, silver, diamond and cameo pendant. A yellow gold and diamond cross pendant. A yellow gold and cultured pearl brooch. A yellow gold diamond ring. A yellow gold and diamond pendant. A white gold, sapphire and diamond pendant and his chain necklace. Two silver white stone pendants. A ruby, diamond, yellow gold and platinum necklace. A yellow gold, emerald and diamond ring. An emerald, diamond and yellow gold ring.